„Sabah al Kheir! 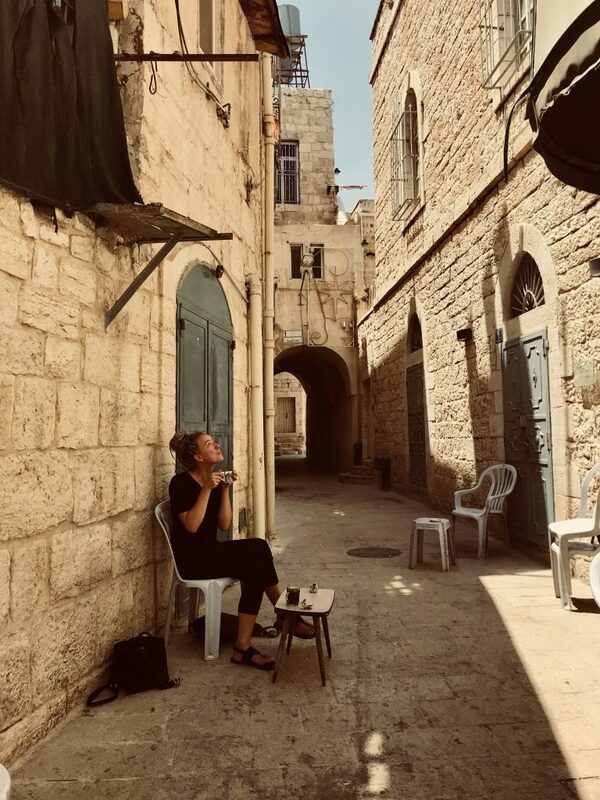 Kyf halak?“ – My arabic isn’t that good yet, but the vendor at Dawoods Falafel Place at Manger Square smiles friendly at me and hand me over my favorite Breakfast – which I do well deserve after the 20 min walk from Beit Sahour along the steepest road I’ve ever walked, up to Bethlehem. Happily eating my Sandwich I’m observing the slowly awaking town: people opening their shops, gathering to have coffee or… „Taxi? ?“ Ups.. There is no time to revel in your own thoughts when you’re obviously not from here. The first taxi driver of the day was approaching me just to offer his overpriced help to a helpless foreigner. „La, Shukran“ I’m answering in my politest voice. „I can take you to the wall and to the Banksy Museum“. Well, first „No“ doesn’t really count. So I try the next one: „Thank you so much I’ve seen everything. Ive been living here for 2 months“. This was my chance to take a hike and continue my way to the next station of my every morning ritual. Taking a cup of the best coffee in the world – or „a glass of tee I will never forget“ – at Samis little coffee shop at the beginning of Star Street just a 2 Minutes walk from Manger Square. Sami welcomes me in fast excited arabic, and Im surprised that I actually understand what he’s saying. My answer though still comes in english. 5 Minutes later I sit on a plastic chair outside of his little shop (There is not really an inside) sipping the best coffee in the world, refined with the perfect amount of cardamom while Sami makes his way through the now busy streets to deliver his famous coffee to customers all over the place. The sun throws its burning rays on the people of the middle east. Its August. The hottest season. It keeps your body sweaty all day long. Constantly reminding you’re alive. I didn’t come as an activist, I’m not religious, I’m not working for an NGO, I never had plans to learn Arabic or Hebrew or in any way get involved in the conflict. Now that I very recently found out that its not love thats keeping me here there must be something else. Its a warm feeling in your guts thats telling you to stay, even if you not sure why. 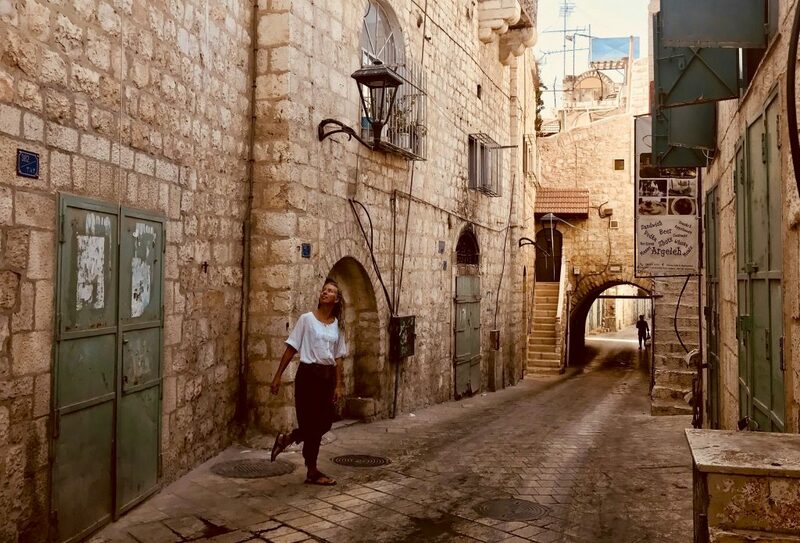 I’m waiting till the sunset before I make my way back down to my little apartment in the beautiful old city of Beit Sahour. I spent the whole day wandering around between the old stones, breathing in the hot air and observing the cheerful life of the city. So much life in a place that means a prison for so many people. Following the street down to Beit Sahour you have a beautiful view over the land. And in the dark you see all the lights of the north and its little villages. Like they trying to mirror the middle eastern sky. I stop for a second to immerse in this beautiful picture. But… „Hey! Do you need a ride? Can I take you somewhere?“ A car just stops by and rolls down the window. Inside a middle aged arab man. And a thought rushes through my mind as I’m passing the last meters home. Streets silent and peaceful now. – Maybe it is(!) love thats keeping me here.